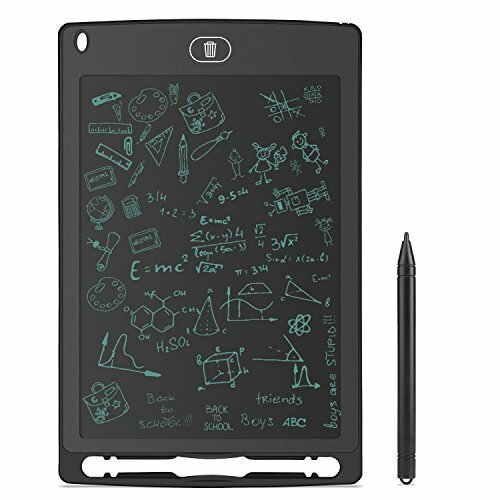 YOHOOLYO LCD Writing Tablet uses flexible liquid crystal display technology. The screen is sensitive to the stylus pressure when writing text or drawing pictures and graphics. It is essentially an eco-friendly, paperless mashup of sketchbooks, memo pads, notebooks, drawing pads- all rolled into one cool little tech product. Writing and drawing on this tablet is a lot of fun. Just take the included stylus and write on it and it feels surprisingly similar to writing on paper. The display can be erased. You don't need to use an eraser. Just press a button and the screen will be cleaned. ✔️Easy To Use: Draw or sketch with the included stylus pen or even with your finger; Erase your image with the touch of a button, extra 2 magnet allows you to mount the tablet on the refrigerator and compatible surfaces. ✔️What You Get: 8.5 Inch LCD writing board, writing stylus, magnet, worry-free 12-month warranty and friendly customer service. If you have any questions about this product by YOHOOLYO, contact us by completing and submitting the form below. If you are looking for a specif part number, please include it with your message.